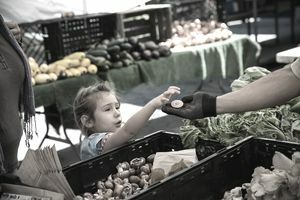 The federal poverty level is a measure of income used by the U.S. government to determine who is eligible for subsidies, programs, and benefits. The Department of Health and Human Services updates the poverty guidelines each January. It raises them to account for inflation. HHS issues poverty guidelines for each household size. For example, the poverty level for a household of four is an annual income of $25,750. To get the poverty level for larger families, add $4,420 for each additional person in the household. For smaller families, subtract $4,420 per person. Guidelines for Alaska and Hawaii are higher since it's more expensive to live there. The chart below calculates it for you. Agencies help families who earn more than the federal poverty level. For example, some programs offer subsidies to families that are 150 percent of the federal poverty level. For a household of four, that would be 1.5 x $25,750 = $38,625. The Supplemental Nutrition Assistance Program is available to those who earn 130 percent of the federal poverty level. Households must also have less than $3,500 in assets with an elderly or disabled person, or $2,250 or less in households without an elderly or disabled member. Medicaid is available to families whose income is 138 percent of the poverty level. The Affordable Care Act provides insurance subsidies for households between 138 percent and 400 percent of the poverty level. Other programs include Head Start, the National School Lunch Program, the Low-Income Home Energy Assistance Program, and the Children’s Health Insurance Program. Federal programs that hand out cash don't use the poverty guidelines. These programs include Temporary Assistance for Needy Families, the Earned Income Tax Credit, and the Supplemental Security Income. In October 2013, the poverty level became relevant to millions more Americans. That's when the health insurance exchanges for Obamacare opened for enrollment. Those making 400 percent or less of the poverty level became eligible for tax credits to help pay insurance costs. As there are varying levels for different household sizes, see whether you qualify to save on monthly premiums. Those making 138 percent or less of the poverty level became eligible for Medicaid. Specific eligibility depends on each particular state. Applicants find out if they are eligible when they apply on the exchanges. Articles such as the “Obamacare Summary” and “How Will Obamacare Affect Me?” provide more information. The poverty level measures a family's annual cash income. Each agency administering an assistance program determines whether to use the family's before-tax or after-tax income in computing eligibility. Other poverty indicators measure total wealth, annual consumption, or a subjective assessment of well-being. These indicators point to one’s standard of living, which takes into account only the amount of material goods and services available to the individual or family. People use the term poverty level to describe both the poverty guidelines and the federal poverty threshold. The U.S. Census Bureau provides statistics on the poverty threshold. It tells you how many Americans live in poverty. The government uses the poverty threshold to calculate the poverty guidelines. As a result, HHS prefers the term "poverty guidelines" instead of "poverty level." It is more precise. The ASPE further describes the differences between the poverty threshold and the poverty guidelines. The poverty guidelines are the same across the nation, except for Hawaii and Alaska. They ignore the wide difference in the cost of living between states. There is also a big difference between urban areas and rural areas. As a result, benefits buy more in rural areas, but the opportunities to find a good job are in urban areas. On the other hand, if poverty levels were adjusted for these variations, even more people would flock to urban areas to take advantage of the higher benefits. The federal poverty level originated during President Lyndon B. Johnson's War on Poverty. It was one of the tools developed to measure and eradicate poverty. In his Inaugural address, Johnson called for "the richest nation on earth" to win the war. He wanted to assist "...American families with incomes too small to even meet their basic needs." This War on Poverty created many of today's welfare programs.